Whorl Books will be selling copies of Strange State and several of the new "Thumbprint" titles on sale March 29, 2008 in Comanche, Oklahoma as a part of the inaugural Border Queen Festival. The event, held at the Asbury Center, runs from 8:30 am until 4:00 pm. "Border Queen" refers to the original old time name for the community. Come, enjoy the event, meet some authors, and pick up some wonderful books! If you love music and the paranormal, you might just lust after this guitar. I know my brother is! Jurassic Park, Lord of the Rings, and ... Bigfoot? A recent post on Blogsquatcher has me thinking. With the exponential advance of CGI technology over the last decade or so and its ever-increasing affordability, one can almost hear the clock ticking in the background. How long before a skilled CGI artist decides it would be both fun and lucrative to render a digitally hoaxed bigfoot video? One only has to look at a slew of recent films, television shows, and documentaries to see how far this technology has progressed. If done well by an artist who won't tip his hand by showing us too much, the image might appear flawless. This weekend I paddled a kayak into the center of a sheltered bay off the island of Vieques, 11 miles offshore from the Puerto Rico mainland. It is known as Mosquito Bay and its unique geography gives birth to a rare and wonderful phenomena. Bioluminescent bays can be found across the globe, but the one in Vieques is truly spectacular. As I ran my hands slowly through the water, tiny glowing dinoflagellates danced like sparklers beneath the surface. And when I swam in the bay, every kick of my legs or sweep of my arms produced an eerie aura around my body. While I played with thousands of these energetic creatures, I turned skyward to a starscape as dark and full as I had seen since a trip to Big Bend a few years back. I could see the Milky Way stretching like a zipper across the night sky. It struck me as I swam in the glowing sea around me, staring at those worlds far above, that - given their rarity - bioluminescent phenomena might explain tales mariners sometimes tell of eerie glowing water or of "something" glowing beneath the surface. Ships such as the Fort Salisbury in 1902 (along the equatorial Atlantic) or the Batang in 1909 (in the Strait of Malacca) have reported unusual luminous phenomena. And it might also explain sightings of underwater UFO's. Taking photographs of the bioluminescent phenomenon is problematic at best. Instead, I am simply posting a picture of the Malecon at Esperanza, Vieques. And, if you wish, I will post some on this blog. 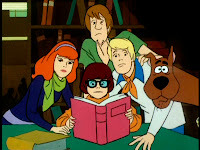 My ideal team to investigate ghosts and haunting phenomena would be comprised of disparate individuals from various fields and exhibiting various degrees of "belief." The goal would be a multi-disciplined approach, with each team member focusing on a separate facet of data collection, analysis, and testing. An individual, perhaps serving as Project Coordinator, who would possess a keen knowledge of haunting lore, myths, and occult traditions. This individual will have a firm grasp of how investigations have operated in the past to determine what has been successful and what has not. A Microclimatologist would be employed to map and catalog the environmental/atmospheric landscape of a given location. He or she will conduct micro-scale thermographic, barometric, and hygrometric analyses as well as chart air flow in order to better establish environmental means and causative agents for reported phenomena. This individual will work closely with a team geologist to collect and analyze ambient gasses that might affect human perception. A Geologist will be onsite to evaluate soil profiles, sub-terranean water sources, faults, and other components of the geology upon which the site rests. He or she will determine if seismic activity, flowing water, or Extremely Low Frequency (ELF) are responsible for any vibrations that can account for purported occurences or optical phenomena. The geologist will also map the electromagnetic environment and produce baselines from those data. A Computer Technology Specialist who is well-versed in programming and database construction will be in charge of establishing specific tools to catalogue and evaluate raw data. This individual will also handle the electronic equipment, which will operate with minimum human contact from a central nexus. This is done to mitigate errors in data collection and to eliminate non-structured sampling. This equipment will scan the environmental methodically instead of haphazardly as has been previously employed in such investigations. Equipment will include IR video, Thermal video, and high-end digital audio as well as more experimental devices such as proton magnetometers, ion counters, and those utilizing stochastic resonance. These devices will be used in an experimental fashion only in order to determine if and what results they might produce. As needed, other experimental equipment will be brought in. This individual must be able to adapt to new equipment easily. An Architect/Structural Engineer/Builder will be brought in to evaluate the structure under investigation to understand how it "behaves" in relation to the environment, the presence of people and machinery as well as look at plumbing, A/C, electrical and, structural fatigue. This individual will analyze the electromagnetic properties of the locale in conjuction, or rather counterpoint, to the geologist. EMF meters will not be randomly waved about. An standard range will be established and then static meters, forming an array, will collect raw data from which the computer will derive significant deviations and correlate those to "spikes" in other recording devices. A Psychologist would be onhand to interview witnesses and determine the validity of their statements. This individual will also monitor the investigating team for signs of confabulation or fantasy. The Historian's job will be to research the investigated site to understand, in detail, its history. A report will be compiled on the site and presented prior to investigation to the Project Coordinator only. The Coordinator, the Historian, and the Psychologist will all sit in on interviews, when feasible. The team Photographer/Videographer's job will be to assist the Computer Specialist in gathering visual data. This individual will ensure that strict protocols are followed when gathering still and moving digital images as well as the occasional use of photographic techniques. This individual will remotely control a host of cameras, reducing human interference in evidence gathering. As needed, he or she can enter the study zone and take additional images in an effort to promote interaction with the studied phenomena if necessary.